Welcome To The Soft Coated Wheaten Terrier Database! 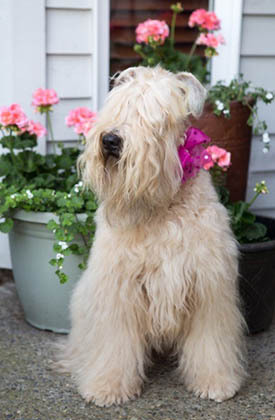 An easy to use resource with data about Soft Coated Wheaten Terriers throughout the world and reporting tools useful to owners, breeders and health researchers. A robust source of information enabling individuals to make knowledgeable decisions about the care, breeding and welfare of their dogs. An accessible repository of data for researchers, making possible the achievement of a breed healthy in mind and body. The database is accessible at no charge to anyone interested in Wheatens. Please read the Database Policies then click on the Database button above to get started. We have a User's Guide to help you get started. Reliable health records benefit breeders choosing mates for their dogs. Owners seeking to add a Wheaten to their family can research pedigrees and health history. The database may help identify health trends. Veterinarians and veterinary researchers will have easy access to abundant data. Because of the importance and sensitivity of health data, anonymous submissions will not be accepted. Health data will be independently verified whenever possible using veterinary records, pathologists' reports, and certifications from registering bodies such as OFA. Unverified health information will be classified as anecdotal in the individual dog's records. Click on Submit Data above to start the process. The Endowment has funded the development and maintenance of this database. We welcome donations in support of this project and the health research the Endowment funds. Learn more about the Endowment at the About Us page. Donations can be made at the link above. The SCWTCA Endowment thanks all those who have spent countless hours developing this tool and keeping it current and vital. Then scroll down and select our breed. A User's Guide with an introduction to the database and features is now available. Click on the link to open or download this PDF file.